The Costa Mesa City Council, in its ongoing quest for greater transparency in government, will hold the first-of-its-kind Special Budget Briefing Study Session on Tuesday, April 26, 2011 beginning at 4:30 p.m. in City Council Chambers at City Hall. Most study sessions are held in Conference Room 1A, but the anticipated community interest in this subject caused it to be moved to Council Chambers. Because this meeting will be held in Council Chambers it will be televised LIVE on CMTV, Channel 24 (Time Warner Cable) and Channel 99 (ATT U-verse) so residents who choose not to come to City Hall can still view this informative meeting in real time. 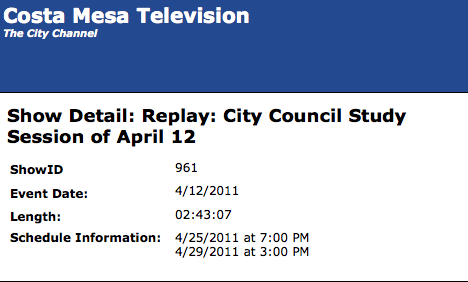 It will also be streamed live on the City web site for those who prefer to view it that way. As is the case in all Study Sessions, speakers will be permitted to address ONLY those issues on the agenda. In all previous Study Sessions comments were restricted to 2 minutes in the beginning with a maximum time limit for all comments. 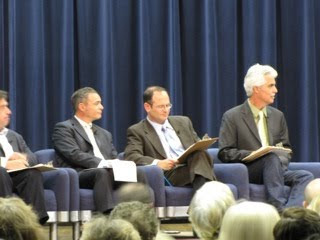 However - in a move that should please most concerned speakers - according to the information given at the most recent City Council meeting by Chief Executive Officer Tom Hatch, residents will be given 3 minutes and will be able to ask questions after EACH segment and receive answers at that time. This is a HUGE change in policy and one that almost certainly guarantees a protracted study session. I think you'll be entertained by the discussions, the banter and the flat-out yelling that went on up on the stage that evening. If you don't wish to watch it straight through, grab the scroll bar on the streaming video to just before 12:00 and watch Steve Mensinger deliver his opinion of "outsiders". Also of interest will be Jim Righeimer's suggestion that we permit sale and ignition of fireworks for the entire Independence Day holiday weekend, beginning on Thursday evening. In an earlier post I, tongue-in-cheek, suggested that I should swing past Lions Park and invite some of the homeless folks that hang out there to the meeting of the Costa Mesa Homeless Task Force last night. Silly me.. that base had already been covered. When I arrived at the Neighborhood Community Center around 5:15 the Adams Room already had a couple dozen visitors, including at least a dozen homeless or former homeless people. 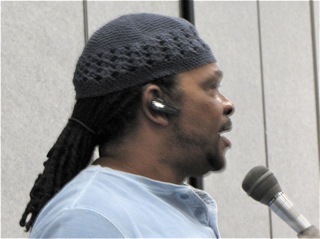 Several of them used the opportunity to speak in the Public Comments segment of the program - relating poignant, personal stories of their time as a homeless person and their individual journeys back from that difficult spot in their lives. I'm not going to try to give you a word-for-word summation of the evening, but will give you my impressions. I was surprised at the size of the crowd last night. The Task Force members alone accounted for around 25 people. Interested community members and homeless and former homeless folks numbers at least another 50, and included a couple of very interested Newport Beach Police Officers, auditing the activities of our task force. 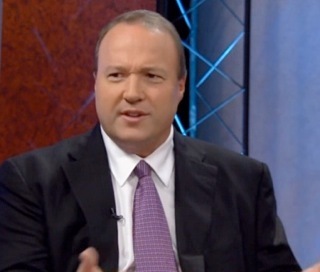 First, much as it chagrins me to admit it, it looks like the Chairman of the Task Force, PR flack and Daily Pilot columnist Steve Smith, is doing a good job. 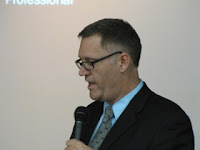 He managed the meeting with gusto and, along with Facilitator Larry Haynes of Vanguard University and Mercy House, kept the agenda moving right along. Christian Bettenhausen, one of our contract attorneys from Jones & Mayer, gave a brief workshop on the Brown Act as it applies to the Task Force. Murial Ullman, Elena Gerli and Lt. Robert Sharpnack of the CMPD each gave reports on current and ongoing actions regarding community outreach and law enforcement. 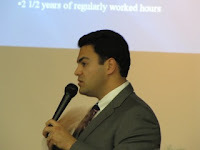 Costa Mesa intern Bijan Mazarji provided a 3-year law enforcement overview of the Lions Park area, comparing it to the broader community. Lions Park is located in enforcement area #1, which appeared to be basically zip code 92627. While crime is down in that area for the period of the study, calls for service in the Lions Park area is up. In his PowerPoint presentation Mazarji told us that calls for service in the Lions Park and Vicinity have steadily increased since 2008. Some of that is due to the added emphasis by police command to focus more on that area. In 2010, 96% of the calls for service in Lions Park were attributed to the chronically homeless, up from 76% in 2008. 2008-1010 the cost of service in the Lions Park Vicinity increased from 3% to 4% of Area 1 costs. Costa Mesa Fire also showed an increase in calls and costs responding to calls for the chronically homeless. Those costs - using a formula with assumptions about certain elements - indicated that total police and fire costs for responding to issues with chronically homeless was less than $70,000 for 2010. Karen McGlinn provided a profile of a "homeless person" - a staggering composite of maladjusted, mistreated and just plain unlucky individuals, many of whom she has come into contact with at SOS. Becks Heyhoe of The Churches Consortium, Russ Carter of Saddleback Church and Phil Eyskens, the new pastor of Lighthouse Church, gave presentations of Faith-based perspectives and combating homelessness. Carter may have summed it up best when he observed that the homeless need an advocate - someone to hear their individual stories who can then help then navigate through the various resources available to them. 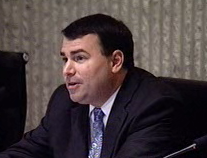 I thought it was interesting that sub-committee chairmen Colin McCarthy and Jeff Mathews were no-shows. I suspect McCarthy is much too busy making up polling numbers and throwing red meat to the masses from his perch as President of the Costa Mesa Taxpayer's Association to find time to fulfill his responsibilities to the Task Force. According to another member of his sub-committee, they had not even met since the first Task Force meeting a month ago. 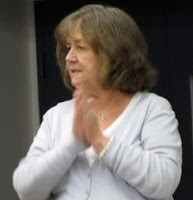 The perky Judi Berry did represent Mathews' sub-committee, though, with a report of an un-scientific survey she and her team conducted of businesses around the Lions Park/Westside. It was anecdotal, not fact-based, and, while interesting, Chair Smith pushed back, looking for more information. At that point member Cambria Briggs chimed in with the observation that they didn't really need to "study" the homeless problem - we know there is one or they - the Task Force - wouldn't be there. She suggested spending the time and energy on finding solutions, instead. 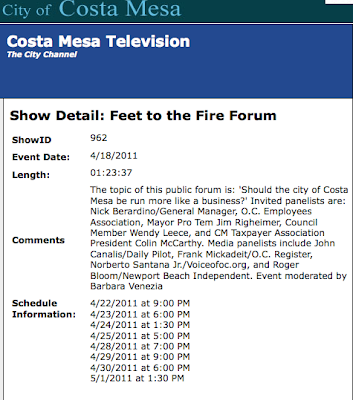 The next meeting is scheduled for May 18th in Conference Room 1A at City Hall. I can tell you that if a third of the people that attended this meeting show up then that conference room will not hold them. Based on my visit to this meeting and listening to all the interesting testimonies and staff reports, I think Russ Carter and Cambria Briggs may be on the right track. We know we have a "homeless" problem in Costa Mesa. The nature of that problem has been well-chronicled by city staffers and residents, alike. We know that young mothers are afraid to use Lions Park - and probably a few other parks, but those numbers were not available last night. We know all of that. We know each homeless person has an individual story about how they reached this point in their lives and, most likely, it will take an individual, specialized effort to help them out of this situation. We know that. We know that there are faith-based resources available to some of the homeless - testimonies last night told of many successes from those organizations. We know that many of the homeless folks need help finding a job so they can afford housing. Some of them need medical and dental care to facilitate their job searches. We know that. Here's my sug gestion. I think The City should immediately locate and either lease or buy one of the many vacant buildings in the Westside and re-open the Job Center. The old Job Center served this community well for almost 2 decades and filled a critical need when it was created. Since it was closed the job-seekers have not vanished, they've just gone back to soliciting work at the same old haunts. We need the Job Center back. CALL IT A "RESOURCE CENTER"
As part of that Job Center - we'd probably call it a "Resource Center" - which was staffed by city employees to the tune of around $100,000 per year, space should be included for an Homeless Advocate's Office - a place where homeless folks could go to get help navigating through the maze of potential resources available to them via social service agencies and faith-based organizations. I am NOT suggesting we create a flop house, where homeless folks could go to get "three hots and a cot". That kind of assistance already exists within the faith-based community. I'm also not suggesting we create a "magnet" for homeless folks. Let's face it - we already ARE a magnet for homeless folks or we wouldn't be having this discussion. The problem now is how to manage this situation. I recognize that my suggestion will cause many of the readers here to become apoplectic and some of you will rant about it not being the City's job to find work for people. Some quotes form Ebenezer Scrooge come to mind. However, the fact is that the Job Center worked and the additional fact is that we have a very serious problem of homelessness in our city. It is a public safety issue, for the homeless and other residents of our city. By creating this new center, including staffing with an advocate, immediate progress could be made to concentrate the job seekers at a venue where they could be matched with employers looking for casual labor and we would make an immediate impact on the homeless population of our city in a positive way - a good thing for us all. I know some will screech that we "can't afford" to do what I suggest. Well, we're in the midst of preparing our 2011-2012 municipal budget, so now's the time to think about it seriously. Probable reductions in the cost of calls for service in the Lions Park area alone will make this idea worth considering now. 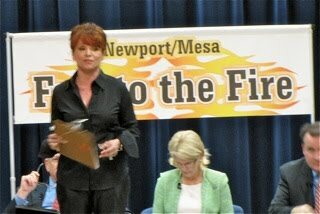 And, since our good friends in Newport Beach already recognize our problem - and since many of the users of the former Job Center were businesses and homeowners from Newport Beach - perhaps they might be willing to participate in some small way in the creation and staffing of the new Resource Center. It can't hurt to ask. We can have the Homeless Task Force continue to meet and study this issue until we know every individual homeless person's story by heart and we can quantify every municipal breath taken and dollar spent addressing the homeless issue, or we can all agree that they've done a good job of helping us focus on this issue, thank them for their fine work and move forward to get something positive done to solve the problem. In my view, the re-constitution of the Job Center as a Resource Center with a Homeless Advocate is the right step. As anticipated, Dane Bora and Brad Long of CMTV have managed to get the streaming video of Tuesday's City Council meeting up and available for viewing. You can view it HERE. 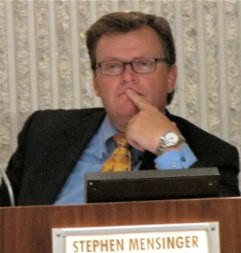 In my previous post I mentioned a comment that non-elected City Councilman Steve Mensinger made at the end of the meeting. I had failed to tape the meeting so didn't have the ability to quote him directly, but paraphrased him. Now that the streaming video is available I have gone back and reviewed his comment. I've also isolated his comment from the rest of the video and present it below my transcription of his comment, so you can read the text or simply listen to him, in his own, unedited, words. "I hear clearly a lotta people out there, some people that are employees and some people that are not employees , some are residents and some are folks just from our town. The people that live here, your opinion matters to me, clearly. OK, I wanna make that clear. The people that don't live here, your opinion is important but it really is noise, because this is our community, and I want to make that clear to the folks from the unions, and the folks that are friends of the unions and the folks that come in here and parade their ideas on the microphone, it's noise. You can speak every single meeting. You have a perfect right to do it, but your opinion does not really matter as much as a person that lives in our community. So, while I appreciate it, a lot of the people in my community are beginning to complain a lot about this particular issue. And that is outside interference in our internal city politics." If you choose to view Mensinger actually articulating these words go to the video (above) and drag the scroll bar over to just before the 2:12:00 point. So, let me g et this right, Steve. If you live in the city your opinion counts, but if you DON'T live in the city - but work in the city, or for the city - your comments are just "noise". If you're in a union or are "friends of unions" your opinion doesn't really matter, right? What about business owners in the city, Steve? Do their opinions count? What about your former boss at Arnel? He doesn't live in the community - does his opinion count? About that "outside interference", Steve. Do you mean those employees who live elsewhere? Are those the people that folks "in my community" are complaining about? 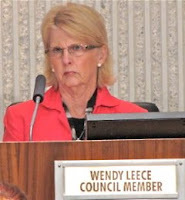 Or, are they complaining about the interference in our internal city politics by the leadership of the Orange County Republican Party, who have decided that Costa Mesa should be - as Wendy Leece stated last night - a Petri dish for pension reform? Is that the "outside interference" the members of "your community" are concerned about? Nah, I didn't think so. YOU DON'T LIKE TO BE CHALLENGED - BY ANYONE! I actually think what you're concerned about is ANYONE who challenges your authority, which is truly ironic, since ONLY THREE residents of this city voted for you to sit up there on the dais. You WERE NOT ELECTED to your office, Steve. You were appointed by your pal, who anointed you with the right to sit there, smirking at the speakers before you while you text away with your buddies. Here's a suggestion for you. How about acting like you are actually worthy of the job you've been appointed to. How about trying to go through a meeting without any of your not-very-subtle zingers aimed at Wendy Leece and those who speak before you? Think you can do that? How about learning the rules of the game and following them instead of trying to reinvent our city into some kind of fantasy world with you as the king. Think you can do that? I sure hope so. 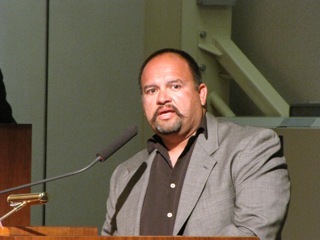 The Costa Mesa City Council meeting Tuesday night started off on a positive note with Estancia High School Football Coach Mike Bargas being awarded the Mayor's Award. Most of the football team was in attendance for the presentation and a couple of the young men spoke, praising Bargas. It was nice to see and an excellent counterpoint to most recent meetings. Young artists from Sonora School were also present and gave individual hand-crafted items to each council member, the City Attorney and CEO. I was feeling all warm and fuzzy by the time we got down to business. 2 - New PERS rates are supposed to be posted on the City web site for review. 3 - A discussion will be held on Fund Balance, led by Interim Finance Director Larry Hurst. 4 - A discussion will be held about our cash flow situation. 5 - Budget deficit - estimated at $5 million at this time. 7 - The latest Sales Tax numbers will be discussed, but he acknowledged last night that they look good - right on original projections. At the May 10th Study Session representatives of our contractor for Sales Tax will be available for questions. Hatch mentioned that there will be a meeting of some kind - council, study session, budget briefing - every Tuesday through May and the final budget hearing will be held on June 14th. 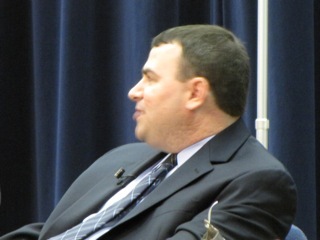 He also discussed t he process by which he hopes to select a new Police Chief. The applications are due by Friday, April 22nd. After some kind of "thinning process", applicants will be considered by three panels. The first panel will be made up of outside law enforcement personnel. The second will be from the non-law enforcement city staff and the third will be from the community at large. He said there will also be a workshop for members of the CMPD, apparently to get their input. Personally, I think this is a pretty complicated process. When push comes to shove it's going to be Hatch's call. I'm reminded of the old saying, "A camel is a horse designed by committee." We'll see how this goes. Fewer than a third of the number of speakers rose to address the council than sp oke the last time. Most of the 19 individuals that stepped up were critical of the council and addressed outsourcing in one form or another. Some were thoughtful and some were angry. 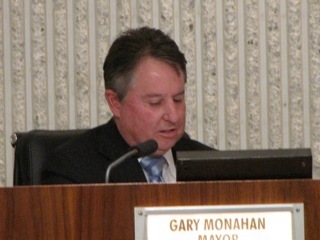 After applause for the first few Mayor Gary Monahan reminded the crowd that he had asked for that kind of celebration to cease earlier - and that he would "trail" the remainder of the public comments to the end of the meeting if the crowd didn't cooperate. It turned out to be an idle threat, but he was obviously much more tense than in previous meetings. I guess having a brick tossed through the door of your business will do that to you. 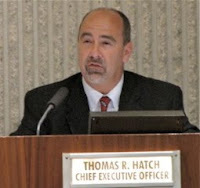 The first speaker was Plannin g Commission Chairman and President of the Costa Mesa Taxpayer's Association Colin McCarthy, who presented a slide show of the push poll his organization conducted last week. It was shameless huckstering for his organization and only the most obtuse observer would miss the fact that the questions in the poll were loaded to get the response McCarthy and his minions wanted. They really do hold the residents of this city in disdain! 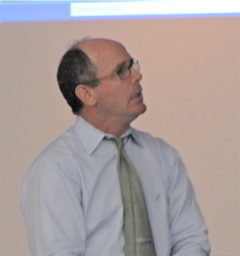 A great counterpoint to that presentation was the one given by former Parks and Recreation Chairman Mike Brumbaugh, who announced plans for a Picnic Pot Luck for employees and others who have lost, or are about to lose, their jobs. He emphasized it was a NON-POLITICAL event, saying that we just "want to pick up those that are down". Brumbaugh will send me more information on this June event and I'll publicize it for them. 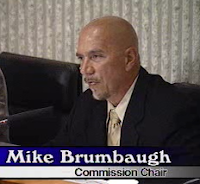 Kudos to Brumbaugh for his recognition that, "We could use a little unity now." The final speaker was Helen Nenadal, President of the Costa Mesa Employ ee's Association. She had not intended to speak, but felt compelled to stand and, once again, remind the council that they are dismantling the city before their very eyes. She told them that many employees are already looking for jobs elsewhere, choosing not to wait until the bitter end in September. She included mention of those who had not received layoff notices, too - implying that there may not be many people left by the end of the year, but that might be their plan all along. A few interesting tidbits came out during Council Members Comments. Wendy Leece reminded the council that our General Plan - our "constitution" - is due for review, and referred them to the section that talks about providing police protection. She also said she's been reviewing the City's legal bills and - at the end - called for a public apology from Eric Bever for his mistreatment of her daughter from the dais at the last council meeting. She didn't get one. MENSINGER - "TROUBLE AT THE SENIOR CENTER"
Steve Mensinger mentioned "problems at the Senior Center", but didn't elaborate. I fear that he may go stomping through there like the rogue elephant he sometimes is. He has apparently been "hearing from citizens" about it - whatever that means. He suggested, in response to Leece's observation about the legal bills, that they all be posted on the city web site. Talk about micro-managing! Same with the warrants that are usually part of the Consent Calendar and never, ever considered as separate items. "I COUNT MORE THAN YOU"
At the end of his little speech he said something that I didn't write down word for word because he caught me off guard. When the replay is available I'll provide you with the verbatim quote. Until then, paraphrasing, he said "people who live here have opinions that matter and those that don't live here don't matter as much." He then complained about "outside interference" in city affairs. Now, one simply must assume Mensinger was referring to speakers who address the council during public comments - many of whom are residents and employees. Is he telling those employees whose careers are at stake and the lives of their families in peril by the current plans that their opinions don't really matter, so shut the heck up? Is that what he's telling us? Sure sounded like it to me. JUST WHO ARE THOSE "OUTSIDERS", STEVE? As to that "outside interference" comment, I guess he must have been referring to the Orange County Republican Party hacks who have been providing the playbook for Jim Righeimer's power play into our city, right? Or, is he referring to the men and women who work in the city but live elsewhere? This is his style - using a sledgehammer when a fly swatter will do. Righeimer ended the evening with a suggestion that, since July 4th falls on a Monda y this year, the city consider abandoning our fireworks sale policy and permit the sale and ignition of fireworks the ENTIRE July 4th weekend, beginning Friday night! I found myself wondering just how he planned to have our shrinking police and firefighters schedule that coverage, especially since we will be without air support for the Independence Day holiday this year for the first time in 40 years. ABLE goes into mothballs the end of June. Yet another example of his "Ready! Fire! Aim!" method of operation. 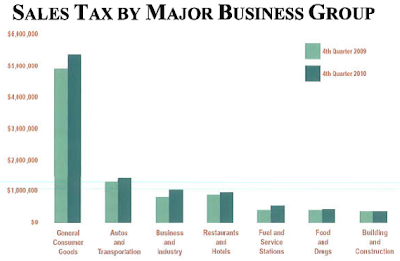 4th Quarter Sales Tax Numbers Announced! 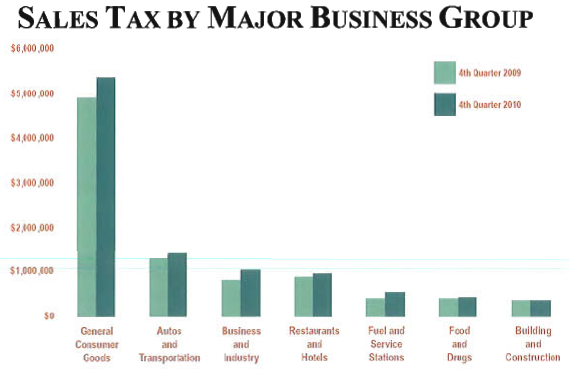 HOT OFF THE PRESSES Interim Finance Director Larry Hurst released the 4th quarter Sales Tax numbers yesterday afternoon. 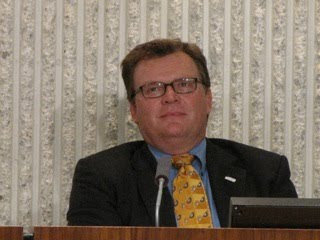 You can read his 15 page report HERE, or locate the link on the City Home Page. One might assume that City CEO Tom Hatch will talk about this report at the City Council meeting this evening. Thes e are the last actual numbers the City will receive before finalizing the 2011-2012 budget, so any trends demonstrated within them will be highly influential in the composition of the new budget. Based on a quick look at these numbers, it appears to me that the City of Costa Mesa w ill likely end up with a balanced 2010-2011 budget - perhaps with a small surplus. That really doesn't mean anything when it comes to next year's budget, though, because our current ruling junta seems determined to somehow fabricate a budget crisis that will precipitate more layoffs and, subsequently, release the city from a big chunk of it's pension burden. Next Tuesday, April 26th, at 4:30 p.m. the City will hold a Budget Briefing as part of a special Study Session. It is assumed that experts in PERS will be on hand to present a view of our situation. This can only be viewed as a good thing, since there seems to be so little trust in the way the numbers are being messed with by our current council. "What did I think of the Feet to the Fire forum last night?" That was the question several people, including Barbara Venezia, the "Energizer Bunny" behind it all, asked me after it was over. Well, I thought it was pretty good, although nobody actually answered the theme question, "Should Costa Mesa be run more like a business?" They answered lots of other questions, but not that one. Basically, it ended up being a discussion of outsourcing and not much else. I would have preferred a little tighter rein on the proceedings. THE CROWD - "IT WAS A TIE"
Judging by the reaction from the nearly 300 people gathered at the Neighborhood Community Center last night, I'd say each side will think they "won" the evening. It was a well-mannered group except for one loud-mouthed knucklehead who heckled Jim Righeimer very early on in the proceedings. He was promptly escorted out of the building without incident. While the crowd was behaving itself, the folks on the stage got a little rowdy during the evening. At times, from several vantage points in the room, it was difficult to hear the dialogue because the participants were trying to out-shout each other. Those on the stage and some in the first few rows of the audience apparently didn't have any trouble hearing the discussion, but those of us in the cheap seats - half-way back and beyond - just got a blast of noise from time to time. I joked with Venezia at the end that she should have had a cattle prod to keep the participants inline. "Quiet! Zap!" Wendy Leece frequently interrupted Righeimer's comments, trying to correct misinformation he was providing. 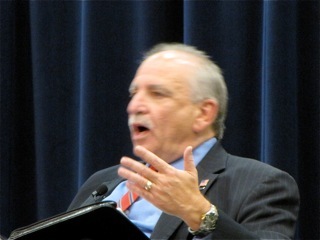 Righeimer frequently interrupted Leece and Orange County Employee Association General Manager Nick Berardino, trying to deflect their comments. 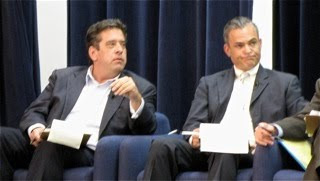 At one point Voice of OC Managing Editor Norberto Santana, Jr., and Righeimer got into a heated debate/shouting match, with Righeimer attempting to deflect Santana's questions by challenging his funding - pointing to Berardino and referring to him as "your boss". The OCEA does provide some funding for the Voice of OC. From my standpoint, it seemed to me that Righeimer and Colin McCarthy were self-assured to the point of cocky arrogance. Righeimer continued to preach the "party line", using fabricated numbers to emphasize his statement that The City is in serious fiscal trouble. He continues to not let pesky facts change his opinion. Several times during the night he said, "We're done with the politics of fear. ", which seems to be the latest buzz phrase provided to him by his handlers in the OC GOP. I guess threatening half the city staff with layoffs doesn't qualify as "politics of fear". I guess inflating the budget deficit numbers so it seems as though the sky is falling doesn't qualify as "politics of fear." And, he continued the annoying practice of summarily dismissing audience as not being representative of the community as a whole, just as he's done at recent council meetings. He used anecdotal "evidence" of discussions he's had with folks at Home Depot as an indicator of the true feelings of the community. It was a curious position to take, since the crowd last night seemed to be about equally split. As I looked around last night I saw many familiar faces - employees and residents who have attended council meetings in recent month - but I also saw many new faces, too. BERARDINO - "WE WILL MEET AND CONFER"
Not much new information was provided by either side, which didn't really surprise me. The biggest news for me was the offer by Berardino to re-open negotiations with The City to try to help balance the budget. That's the first time we've heard that either side is actually willing to engage in the "meet and confer" process this time around. Before the meeting began representatives of McCarthy's Costa Mesa Taxpayer's Association worked the crowd, jamming into their hands copies of a recent poll they conducted - a push poll, with questions akin to "Have you stopped beating your wife yet? ", and a very misleading "Compensation Report" which purported to show 2010 compensation of employees who "earned" over $190,000 last year. The problem with that "report" was that it's not accurate! It is distorted by lump-sum payouts of vacation pay for retirees and those who otherwise left the city. Both documents were clearly designed to inflame the crowd, just as Righeimer and McCarthy's inaccurate statements from the stage were intended to do. 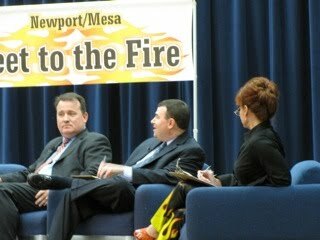 All in all I'd say the Feet To The Fire Forum was a success. Yes, it would have been better without the shouting matches, but it turned out OK. Soon you'll be able to judge for yourself. Dane Bora and Brad Long of CMTV tell me they hope to have the tape placed into the rotation by Thursday and the streaming video up before that. I'll let you know and provide a replay schedule as soon as it's available.